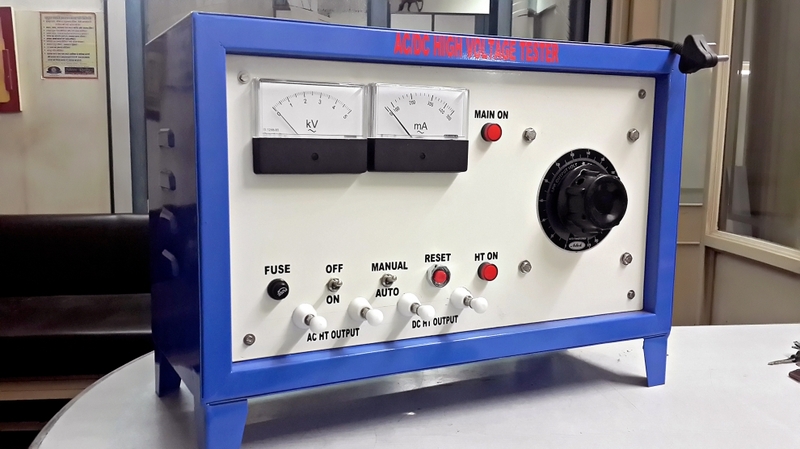 Taking into consideration the wide requirements of various industries, we have marked a prominent space for designing and manufacturing AC-DC High Voltage Breakdown Tester, which is suitable to be used for precise and fast testing of various electronic materials, equipments and components. Our manufactured Testers are provided with a high capacity and a manual mode of operation. The AC-DC High Voltage Breakdown Tester is tested with the help of our efficient personnel with utmost care and then aligned for transition process, so as to provide safe and damage free delivery. ‘ASHOK’ make AC-DC High Voltage Breakdown Tester is perfect for fast accurate & reliable testing of withstand/Breakdown test of electrical & electronic materials, components, equipments, panel boards, etc. 5.Speedy and Accurate Testing of Breakdown/Withstand Test of Electrical & Electronic Components, 6. Materials, Equipments, Panel Board Etc. 6.Audio & Visual Alarm when HV on & off. 7.Test ON & OFF switch to start & interrupt Test. 8.Precise Trip Current Setting or Press to set switch for Leakage Current. 9.Inbuilt timer with Selector switch or variable by thumbwheel setting. Input Voltage 230V, +/- 10%, 50Hz, 1 phase A.C.
Capacity 50Ma, 100Ma, 250Ma, 500Ma & 1amp.